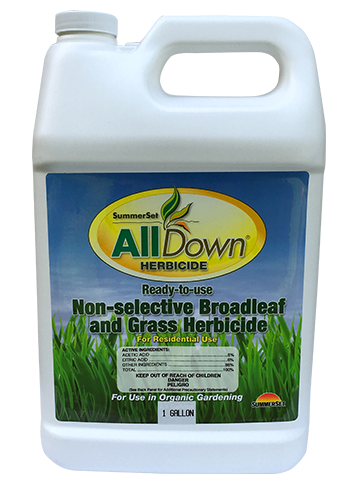 Summerset AllDown Concentrate is a fast-acting, non-selective contact herbicide for the elimination of broadleaf and grass weeds. This synergistic blend of 23% Acetic Acid and 14% Citric Acid is very effective to burndown or kill unwanted Broadleaf Weeds and Grasses. Approved for use in organic farming. Use in flowerbeds, vegetable gardens, around trees and shrubs, along fence lines, patios, driveways, sidewalks, fruit trees, vines, and other areas where weed control is desired. Repeat applications may be required for larger perennial weeds or if re-growth occurs. 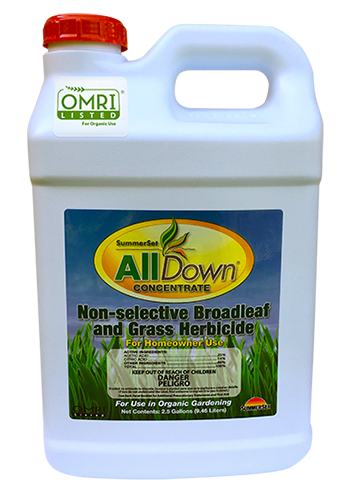 Summerset AllDown Concentrate is a fast-acting, non-selective contact herbicide for the elimination of broadleaf and grass weeds. This synergistic blend of 23% Acetic Acid and 14% Citric Acid is very effective to burndown or kill unwanted Broadleaf Weeds and Grasses. Approved for use in organic farming. Use in flowerbeds, vegetable gardens, around trees and shrubs, along fence lines, patios, driveways, sidewalks, fruit trees, vines, and other areas where weed control is desired. Repeat applications may be required for larger perennial weeds or if re-growth occurs. Apply when skies are mostly sunny and no rainfall is predicted within 4-6 hours of application. Apply when the air is calm and temperatures are 65-90 degrees F. Best results are achieved from spring to early summer when young weeds are growing more actively, and on small weeds less than 3-5 inches high. Weeds that are mature, dormant or hardened due to moisture stress are more tolerant of herbicide treatments. Only contacted vegetation will be affected. Apply to target vegetation in sufficient volume to thoroughly wet the leaves.